Researchers browsing through a profile of Benjamin Franklin on Wikipedia made a startling discovery of a diagram drawn by the American that proves that he – and not the computer company Apple – invented the popular portable music player, the iPod. Despite the fact there is clear historical evidence that this is a diagram of a water spout - researchers have stated its appearance is far too similar to an iPod to simply be put down to chance. Whilst Apple has not yet responded to this revelation, it is believed that the Franklin estate will be able to claim hundreds of millions of dollars in royalties – as well as inherit financial control of the iPod brand. 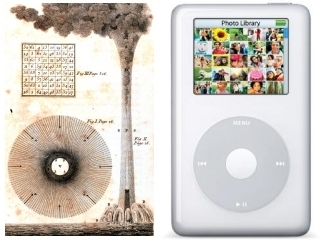 “When you look at the picture it quite clearly shows an 18th century representation of what an iPod looks like,” leading Franklin researcher Chuck Hankman commented, “And its no good people asking how Franklin could know this device could work – remember Leonardo Da Vinchi invented a helicopter and he had no idea how to power it. Franklin pioneered a lot of work in electricity – no doubt he foresaw that one day it could used to power a portable music player for millions of people to pass a few dull hours of their mundane daily lives.